I was captivated by this cover from the first time I saw it online. It is simply gorgeous. The memoir inside is equally beautiful, and I’m so glad I read it. 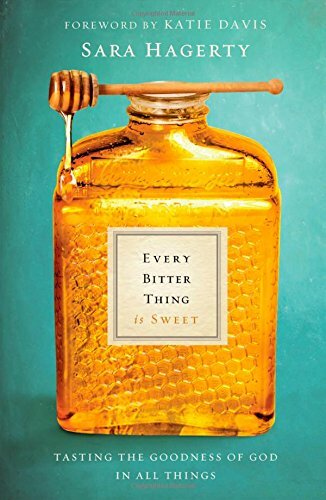 Every Bitter Thing Is Sweet: Tasting the Goodness of God In All Things is Sarah Hagerty’s story of figuring out the challenges of adulthood. Existential questions about the nature of God, practical struggles with the constraints of new marriage, and then later, the pain of more than a decade of infertility. Hagerty is very open about some of these challenges, while others are veiled in metaphor. Her writing style is more artful than straightforward, but once you get used to it it carries you along like a series of gentle waves. And it takes you to some interesting places. Such a profound distinction–I underlined this whole section and put stars up and down the page. Later, Hagerty and her husband adopt four children and the gift of that big house makes total sense to everyone. To get to know Sarah, check out this talk she gave earlier this month at Changing Seasons. This entry was posted in Book Recommendations, Books and tagged Changing Seasons, Every Bitter Thing Is Sweet, Sarah Hagerty on October 29, 2014 by Trish Ryan.